Stella was born suddenly and without a lot of warning, she was a fighter from day one and proved how strong such a little baby can be. The Staff in Unit 8 were heroes and worked effo rtlessly to help Stella overcome many obstacles, sadly after 3 long weeks Stella passed away in the arms of her Mum and Dad. Stella's parents have established this fund in her memory, to help support our staff and the parents of the other little fighters, like Stella, in our Neonatal Intensive Care Unit. To donate to Stella's Fund, please click the button below and include "Stella Triggs Fund" in your comments. Thank you for your support! 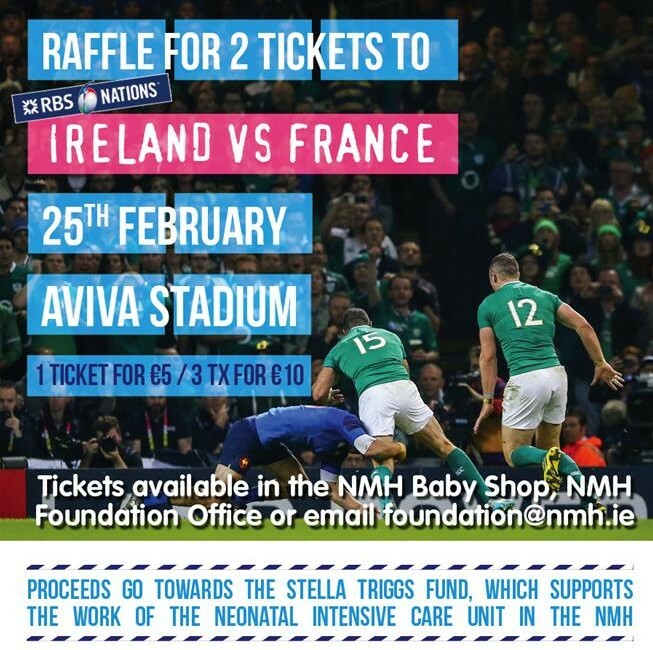 This raffle took place on February 21st at 15.00 and the lucky winners were Jenni Redmond & Ann O'Brien!Jenni Redmond won tickets to the Ireland vs France match and Ann O'Brien won tickets to the Leinster Quarter Final! Thank you so much to everyone who supported the Triggs Family.